Set and Costume Designer Christina Smith speaks to Megan Byrne about the process of creating her designs for The Seed. Rendering costume designs would have to be one of my favourite parts of the design process. Even as I’m making my first hesitant marks on the paper, I’m thinking about the character and the actor playing them. In fact, after I’ve mapped out the figure I’ll often put detail into the face first as a way of prolonging this early conceptual process. It seems odd…as the face is really the least important part of a costume drawing in terms of conveying information, but for me it is an intrinsic part of conjuring up the character. Needless to say, I tend to spend far too long on my drawings. I’ll also include many reference images with the sketch, often gleaned from magazines, blogs and photographs. These generally give a clearer technical picture of where I’m going, particularly when it comes to contemporary costume design. I love to have a pile of references with me when I am talking through the ideas with the director and the actor, and it can be a great shortcut to understanding what we are all picturing…which can sometimes be three completely different ideas. I find designing costumes for contemporary pieces more collaborative than period pieces – this is primarily because we are all experts in our own time period. We see clothes on people constantly, we buy clothes, we understand what kinds of clothes convey certain messages. Comparitively, people know significantly less about period clothes, and as a costume designer I am often more heavily relied on to make the correct choices for a production in those circumstances. 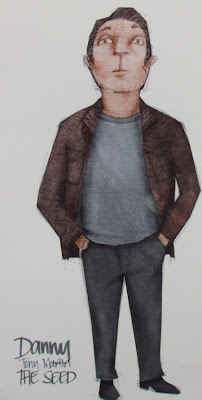 Brian’s actual costume ended up being entirely different to the costume rendering, which is not at all uncommon – particularly in contemporary costume design. 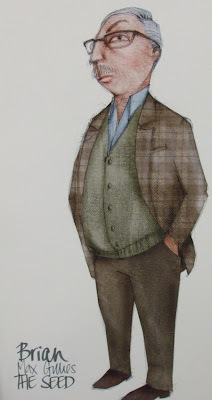 Anne-Louise and I had used a photo of the real ‘Brian’ as a starting point (generously provided by Kate Mulvany) that seemed perfect… but on Max Gillies, the look appeared a little too relaxed and gentle. A lot of discoveries were made early in rehearsals about how Brian would stand, move and sit – and so we shifted the costume design to match the formality of ‘our’ Brian’s developing characteristics. We settled on Danny’s look quite quickly – the second jacket he tried on was just perfect. For the rest of his costume, we explored the role of his unseen wife Glenys in his life – we imagined that she had bought the rest of his clothing especially for the trip. Particular attention was paid to the shoes…a small detail, but Kate Mulvany recalled how shined and well cared for her father’s shoes were – a left over from life in the army. There is an ongoing wardrobe maintenance note to keep his shoes very shined as a result. that we didn’t drown her in heavy clothes, even though the play is set in Nottingham during November. I have often found that sometimes historic or geographic accuracy needs to make way for the practicalities of performance as well as the clarity of the narrative. As a designer, I am far more interested in the telling of the story than following facts. To get a glimpse of The Seed, check out our special teaser video. “The Seed”: is now playing at Arts Centre Melbourne, Fairfax Studio until 4 April.